Combine vinegar and mustard, in medium bowl. Gradually whisk in oil. 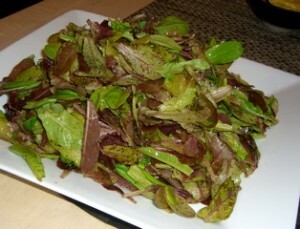 Season vinaigrette to taste with salt and pepper. Whisk in herbs and garlic. Place greens in large bowl. Toss with enough vinaigrette to coat and serve. Thanks to Kristin Frost Albrecht for this recipe.